During September and October, winter plays hide-and-seek with summer. Cold nights give way to warm days. The leaves are stunning, and we scramble to finish yard tasks. By late November though, the niceties are over, and winter has won. Here in Western Washington, that means a cold, miserable 38 degrees and raining. We retreat inside and wait for warmer, spring rain, which will show up again ‘round about April. The one bright spot throughout our soggy season are the birds that hang out in the yard over the winter. We have shy nuthatches and wrens, which skitter away at the slightest movement. There are bossy jays, gregarious chickadees, and noisy sparrows. Anna’s hummingbirds sit in the shrubs on freezing mornings squeaking until I bring out the thawed nectar. Bird feeding is the perfect “gateway to science” activity for the whole family. The littlest kids can participate, and big kids enjoy it too, even if they’re too cool to let on. If your yard is empty of feathered friends, a small investment of time, effort, and a lot less money than you might think, can change that. Now you have your seed, but what to serve it in? This is where a bird-feeding hobby can really break the bank. There is a plethora of feeders available, many of them beautiful and quite expensive. For really cheap bird feeders, look no further than your recycle bin! Most of bird feeders in our backyard are simple frames made of scrap lumber with sturdy screening stretched and stapled to the bottom (like the kind you’d find on a good screen door). They have four legs, again made of scrap lumber, which are nailed or screwed to the frame. That’s it! My trees are hung with recycled orange juice cartons. They have squares cut in two sides and holes poked into the bottom for water drainage. The neighbors might wonder at the trash in the trees, but the birds don’t care. There is no end to creativity when it comes to bird feeders from recycled materials. While researching I came upon feeders made from milk cartons, orange rinds, pumpkins, and even a slinky! There are way too many ideas to list here, but you can type “bird feeders recycled materials” into a web search and see what I mean! Once your feeders are set up, don’t despair if the birds don’t flock to them right away. Birds find food by sight and they have “regular” stops. They may not find your new restaurant right away, but once they do, you’re sure to get rave reviews. Please Keep the “Restaurant” Clean! Just like “people restaurants,” bird-feeding stations can become sources of disease if not cleaned properly. Good hygiene includes regular cleaning of feeders with bleach, soap, or solutions sold especially for this purpose (at our house we use undiluted vinegar). 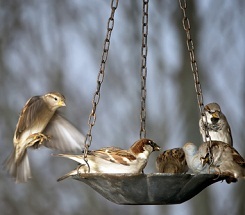 If your feeders can be moved, rotate them around the yard. Rake and remove excessive debris to prevent mold growth. Audubon has helpful cleaning protocol for feeders and birdbaths listed on its website at http://web4.audubon.org/bird/at_home/bird_feeding/feeder_maint.html. Your family can take bird feeding to the next level by joining Cornell Lab’s Project Feeder Watch. Feeder Watch is one of the earliest citizen science projects. Amateur birders from around the country spend time each winter recording the birds that visit their feeders. The data is submitted to Cornell Lab and is used by ornithologists to track wintering bird movements across the continent. Project participants include people of all ages and you truly do not need to be an expert to join. Invest some time, effort, and a little money and your yard or balcony can be a source of entertainment and education all winter long. I know of many avid birders, scientists, and amateur naturalists who trace their love of the natural world back to creatures they observed at home. You never know what a moment of wonder at the window might inspire.